It has been long LDS tradition for the altars of the temple to be covered in hand made laces, called altar cloths. As we’ve built more temples, the need for this unique gift of lace has grown exponentially. The lacemakers of older generations are passing on and taking their skills and knowledge with them. I decided recently I wouldn’t let that happen, and I’m currently working to help those of my generation learn these skills. The patterns don’t have to be detailed, they can be simple, but they’re needed, and anyone can do it with a little practice. 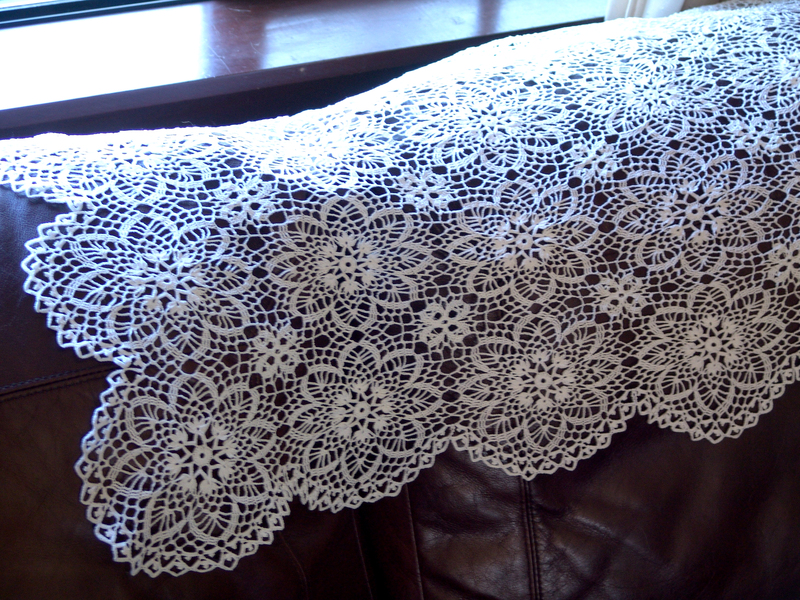 This lace pictured above was made by a dear friend of mine who knew how to crochet, but had never made lace before. This is her first altar cloth. It is beautiful! If you have a desire to learn to make lace for the Lord, contact your temple matron. She has the instructions and will be so happy to see you. If you have a desire, but don’t know how to begin, let me assure you, this is a skill anyone can learn. I am teaching it to my children, and anyone I can find who has even the remotest desire. I’m happy to answer specific questions, just drop me a note. These scarves are beautiful and hope I can do them justice as I start to learn this timeless art. I am living in Germany, we don´t have the tradition of lace-making as you have. Today I have found your homepage. It is quite astonishing and so beautiful. I haven´t made Crochee or knitting for a long time. I had been inventing patterns with flowers for knitting many years ago.